How many times have you received an email from a company and completely ignored it? If you’re not actively working to keep subscriber attention, email open rates and responses tend to tank quickly. More times than you’d ever be able to count. I’m willing to bet you have a folder of dozens if not hundreds of newsletters, promotions, sales or other sales-y emails that you’ve just been too lazy to hit “select all –> delete”. These days we’re simply bombarded by so many emails and advertising messages that rather than curating the ones we want to see, we usually just tune all of them out. 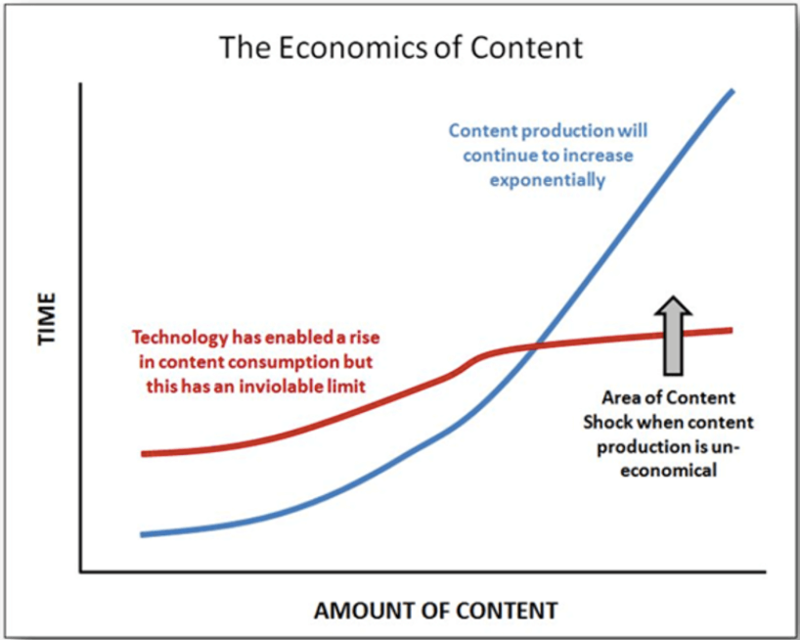 There’s even a term for it, coined by Mark Schaefer: content shock. Anything above that red line is not getting read, ouch. So as a business owner, how do you combat that? 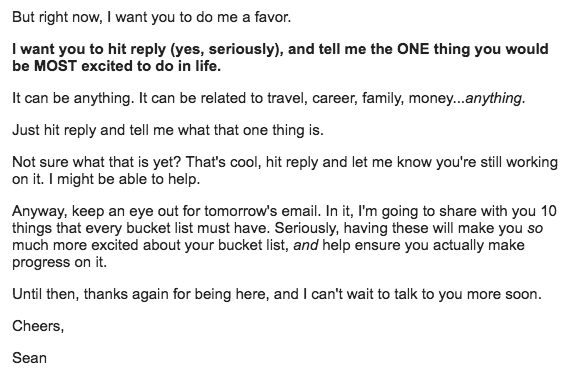 How do you get people to not only read and respond to your emails but be excited to see them? Well for us, the answer was to stop treating them only as leads and start treating them as relationships. Before we go in depth on how to do that though, the first thing you have to do is make a mindset shift. Here’s the deal: we all think we’re more important than we actually are. We think our businesses and our work are completely revolutionary and that everyone is going to be as excited as we are as soon as they see our message. There’s just one tiny problem. What you’re doing isn’t that unique. There’s one lesson I’ve learned and thought about a lot over the years, that I randomly stumbled upon while reading a magazine in a NYC hotel room. The article was about the rap pioneer Chuck D. And in it, he had a quote that changed the way I looked at my business forever. Most companies spend zero time or effort getting people to buy into you and your mission. Rather they focus on mass emailing, mass messaging, and hoping that they can rely on sheer numbers alone to get a little bit of a response. But if you’re a small business, you don’t have that luxury. Every single person that comes to your site or is on your email list is an opportunity to build a relationship and create a fan and an ambassador of what you’re doing. In this post, I’m going to share with you exactly how we treat our leads at Location Rebel as relationships to be cultivated, rather than a statistic we’re just trying to sell to. 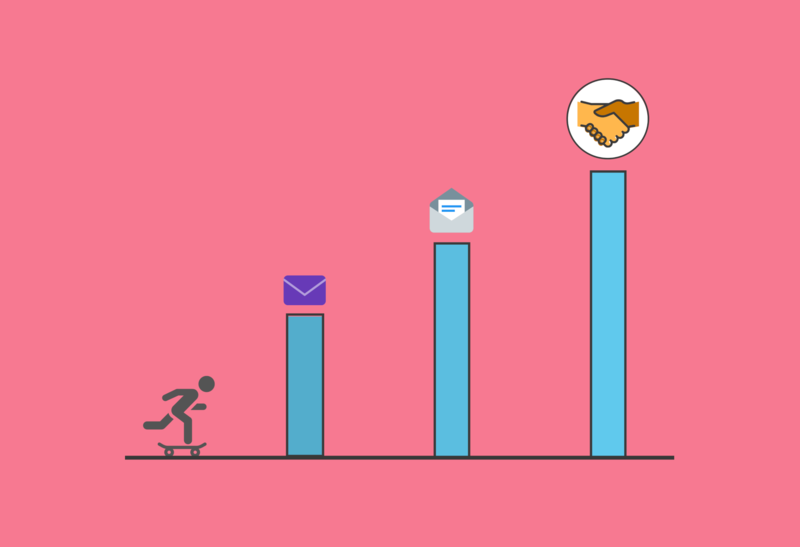 What happens when you sign up for most email lists? Chances are you might get a discount code or some sort of bonus. Most likely it’s in a flashy HTML formatted email that looks very professional and business oriented. What is that going to do as far as getting people to buy into you? There’s no personality or connection! For the last few years, we’ve used this first email as an opportunity. When you sign up for our email list, you’ll get one email with whatever bonus you signed up for (these have naturally high email open rates), but you’ll also get another one that is very personal. In it, I thank them for coming, but then I ask them to do something they usually haven’t seen before. What is your biggest struggle currently? Most people are caught off guard by this, and many get slightly uncomfortable at the thought of reaching out to a stranger. But we’ve had about 25% of people still hit reply. In doing this, it forces them to think about the answers. A lot of times, at the end of the email they will say answering the questions helped them, or they discovered something they never thought about before, or they were just happy to say this out loud to someone else. Plus, it gives us extremely meaningful information, and most importantly it’s the first step in building trust and a real relationship. But what comes next is where the magic happens. Ok, so they’ve responded to your email, thought about both what they need help with, along with what their perfect end results look like. This is where you have an opportunity to truly blow their minds. By sending them a personal reply. Who would have thought being a thoughtful, engaged, human would actually lead to good things? You see consumers have been trained to think that all businesses are the same. There’s a nameless, faceless corporation behind those emails that send out the same tired promotions and discounts. For every person that sends us a thoughtful reply, we’ll give one in turn. Specifically, we can usually point them in the right direction for some starting points for their issues. Often times at Location Rebel, we have content or resources that help. Other times we send them somewhere else. The whole goal is to be helpful and do our best to treat them as we would treat a close friend. That personal touch, rapport building, and unexpected gesture help us to turn our leads into relationships — which in turn helps us not only increase our bottom line, but it helps us deliver better and more tailored results as well. When you think about it, that’s crazy, because we highlight the fact that we do respond to every email; so many people are conditioned to having a brand say one thing and do another that when we follow through they are shocked (in a good way). Like I said, we’ll usually get about a 25% response rate from that first email — most people are still skeptical at this point. But in subsequent follow-up emails, in our weekly newsletter, or in any sales messages we strive to always keep that personal element there. We continuously remind people through every touch point that all they have to do is reply and they will get a real response. Often it can take a long time, but getting that response makes all the difference in the world both in sales, and customer satisfaction. Right now, you might be thinking that you don’t have the bandwidth to do this, or that it’d be too difficult for you to personally answer everything. And, I get it, it’s an investment and it takes a lot of time. For the first four years of doing this, I answered every single one of these emails personally. And it took close to 50% of my working hours. But it paid off in real relationships and a growing business. Two years ago, we started dividing our responses with our community manager (we made sure to highlight this in the emails), and have seen no negative results because of it. As long as you have someone knowledgeable about your company and industry helping out — you’ll be in good shape. Alright, you’re probably thinking you don’t have hours to devote every day to answering emails in depth. But, in the vast majority of the cases, you don’t need to respond with more than a few sentences. A big part of this goes with how you format your emails. Like I said above, asking those two questions is far more of a thought exercise for them than for us. And, since we get a lot of the same responses (more on that later) you can get into a pretty good rhythm of knowing how to respond effectively. We’ve found most people are happy to get any kind of personal response, even if it’s only a sentence or two acknowledging what they wrote, pointing them to a particular direction, or offering a bit of encouragement. Is this something that you’ll see giant Fortune 500 companies implementing in their business? Probably not exactly (although elements of it, could certainly help). Even smaller 6 or 7 figure businesses with small teams may struggle to handle the volume. But if you’re a business doing under $500k a year, and you want to find the single best way to engage your customers and get them to “buy in” to what you’re doing — I’ve yet to find a way that works better. And if you are a bigger brand and want to give this a try, work on building a segment that lets you communicate with a particular subset of people. See if that personal communication can turn them into buyers. The primary goal of this is to connect with people and build relationships. But there’s also a pretty cool side benefit of this too. You can find out tons of information about your readers. When you go through dozens of emails every week it’s easy to spot patterns. And frankly, where your own content might be missing the mark. We’ve created not only dozens of blog posts but entire blueprints and courses based on the information and common questions we’ve gotten from these emails because we’ve spoken with people who want it. It’s sort of built-in market research. Not to mention, we’re able to understand the motivations, fears, and desires of people. Which we can translate to other marketing materials like sales pages. To finish up, I want you to think about what aspects of this you can implement in your business and email marketing? In a modern world where everyone seems to be trying to find the best way to automate, and take themselves out of their business, there’s an increasing opportunity for people who are willing to add some personal connection back into their business. It’s worked extremely well for us, and I’d be willing to bet it could work well for you as well. Sean Ogle is an expert at helping people turn their passions and skill-sets into sustainable businesses that can be run from anywhere on Earth. As the founder of Location Rebel, he has built the premier online community for lifestyle entrepreneurs looking to break out of routine and build a business that matters.